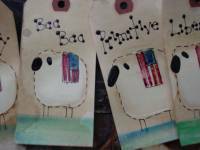 Making Primitive Kraft Tags for your Bear Bags. and come up with. 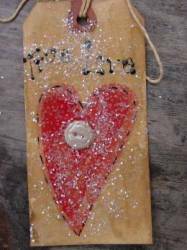 Great craft making ideas for use with the whole family. 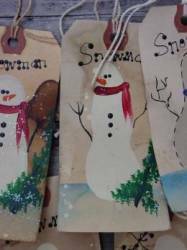 Christmas crafts, wedding crafts, birthday gift ideas. Christmas candles cheap and easy make gifts for everyone. 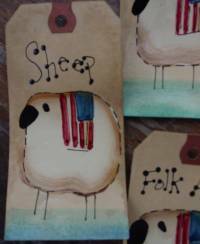 hang tags of my own forsale. unique and hand painted by me! keep me too busy at that time. 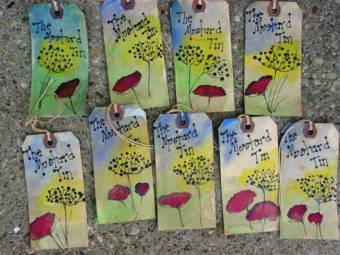 You get 10 hand-painted hang-tags for 10.00 plus 4.95 shipping. Makes for great additions to packages when gift giving. who wanted their tags personalized to their shop. 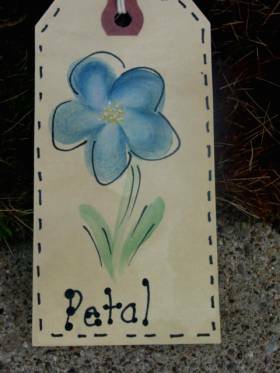 hand painted, I do not use stencils. only 10.00 and this includeds shipping. words to show up more. different, no two alike! 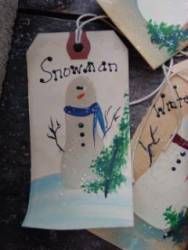 The back of the hang tags are blank, so you can personalize your own tags for gift giving or craft projects. Will be adding more as I paint! Mix together. 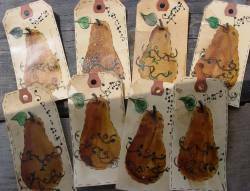 Soak tags in coffee mixture for 10-15 mins. Lay on cookie sheet lined with paper towels. Bake at 200 for about 15 mins. rub for a great grubby look. Air dried the fabric. Air dry the fabric, don't put it in your dryer. water. Lots of instant coffee! I dunked the tags once, then let dry, then dunked again. That was it. two fat, plump dots side by side, barely touching. Experiement on plain paper to see what you like best. 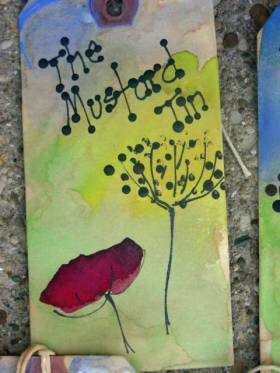 the hangtags with acrylic paints is very nice, if you are crafty this way. 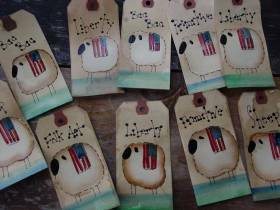 The tags looked so good, we started adding them to our candles and scented bears. Check out our Candle Trivia and Fun Facts. Cool Beans! This is a craft recipe you will love. 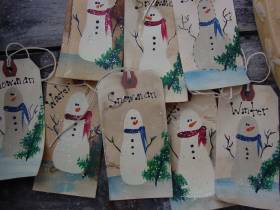 These are the coolest primitive snowballs and icicles for your Christmas gift giving pleasure. 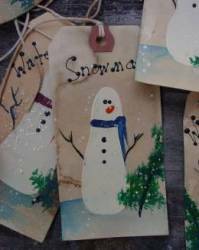 Make old fashion Vintage looking Winter icicles, snowballs, and snowflakes for Christmas or Winter Weddings. These make the greatest center pieces for a feasting table. 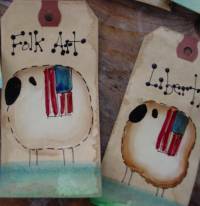 make a little extra money at the next craft show. 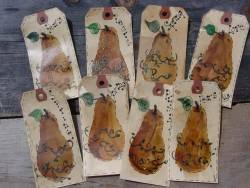 dried, or use your imagination and see what you can come up with. You will be able to enjoy these Snowballs all winter long. So will your family and friends. They easily store out of the road by just wrapping and placing in the box with the other Christmas ornaments. 1950's and 60's. Moms were mom and dads were dads. I hope you will find this recipe will bring hours or joy with your family, as it did with mine. You can make them unscented or add a little scent, the choice is yours. I love to add Prim glitter to mine. Give them more of a festive feel and looks great in a big wooden bowl on a white table cloth. these to sell at a craft show, you may want to leave the children to their own side of the table. Don't you just love a Vintage Christmas. The Victorian look and feel of Old Time Christmas. Start with a pack of Styrofoam balls found at any craft store or craft section. Any size will do. snowflakes. Now, when making the snowflakes, use a sponge brush to dab on the joint compound. Diamond Dust or Glitter Glass found at any craft shop or on line. Candle scent - we have a very nice selection. Make sure your bowl of glitter is ready, just set aside. 4 - For flecks that look like dirt, add cinnamon or nutmeg to the snowball mixture. Start rolling the Styrofoam balls in the joint compound. Be generous with the mixture. Roll it alot for a nice even coating..
now, and gently shake off any loose glitter. have to be turned twice a day, like a mother bird turns her eggs...lol Don't turn them evenly. There you have it, another creative craft creation straight out of our past to you. Enjoy this with your children, they will love it. packaging. Old enough to remember the pet rock???????? Or the pet Tumbleweed???? better way. Experiment, you can always do better then me. ripped material. You can get those bags from the grocery store that are paper with the see through plastic window in the front. rag balls and snowballs of different sizes. Kids love making snowballs, and best of all for kids, they look better when not perfect. You can have a truly primitive grungy Christmas gift that anyone would love. You could even make a lamp with the old blue mason jar. it is still wet and it will dry solid. You can hang them on a Christmas Tree this way. but, on the other hand, why do the work at all when you can buy! 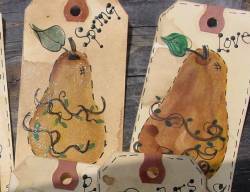 Hangtags make wonderful additions to any birthday present, wedding shower favors, or any gift giving occasion. Each design is hand painted, except the horses, they are stamped then painted. Their email is jodycoyotek@earthlink.net Just add Hang Tags in the subject line.